Action Performance Companies Inc., the leader in the design, promotion, marketing and distribution of licensed motorsports merchandise, today announced the release of the latest "fantasy" race car collectible from The Jeff Gordon Foundation. The car is a holiday special featuring Santa Claus, and proceeds from the sales of these collectibles will benefit the charities supported by The Jeff Gordon Foundation. Since it was established in December 1999, The Jeff Gordon Foundation has focused its efforts primarily on children’s causes and family-oriented charities, including The Leukemia & Lymphoma Society, The Make-A-Wish Foundation, Riley Hospital for Children and The Marrow Foundation in partnership with the Hendrick Marrow Program. In 2001, The Jeff Gordon Foundation began issuing a special fantasy die-cast collectible in order to offer collectors and Jeff Gordon fans the opportunity to share their support and contribute to so many worthy organizations. The initial success of the die-cast program ensured it would become an annual benefit for The Jeff Gordon Foundation. The first three special edition die-cast cars all featured imagery from Sesame Street, with proceeds shared between The Jeff Gordon Foundation and Sesame Workshop. 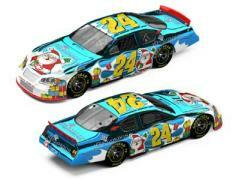 This year’s "Santa Claus" car, designed by artist Sam Bass, is the first vehicle being released as a holiday special. Action Performance will produce the vehicle in a 1:24-scale Colorchrome metal edition. As with past die-cast releases from The Jeff Gordon Foundation, the "Holiday" fantasy collectible will be available through Action’s standard distribution channels. To reach one of 16 Action Racing Collectables distributors, call the locator line at 1-800-411-8404. The Racing Collectables Club of America can be reached at 1-800-952-0708 or visit RCCA online at www.goracing.com.